Sorry, your added now and so is Luminar. No 1.6 for a while. He's decided to make Nether work in multiplayer, so that'll take some time. So 1.6 will have Maps, and Nether working in Multiplayer, as well as bugfixes. Too bad Terraria isn't out yet. I'd play that in between the Minecraft updates! I wouldn't mind the delay for Nether playability. And we already have a portal prepped and ready too. I hope all players can be in either place simultaneously. If they'll be able to, the time distortion will be right out. Perhaps time runs normally if people are on both sides of a portal, but if everyone's in the Nether it displaces like normal? Maybe. Time really doesn't matter in the Nether. No matter what time it is in the normal world, Nether time is always constant. If any though, anyone currently in the Nether may or may not have to be in bed for others to sleep outside the portal. Hopefully not. Overall, I hope the passage of time between the Nether and the normal world should be independent. Since when was there time distortion in the Nether? I would spend like five minutes in the nether and when I came out it would be midnight. And I left at morning. 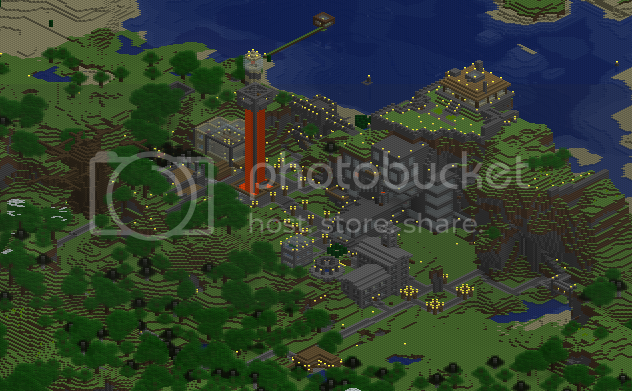 New rendered map of Faffington. I see someone has been busy off in the distance. Yeah I built up that fort a long time ago. Still kinda worked on it, but not really. I'll probably pop in on the weekend, see what needs doing. 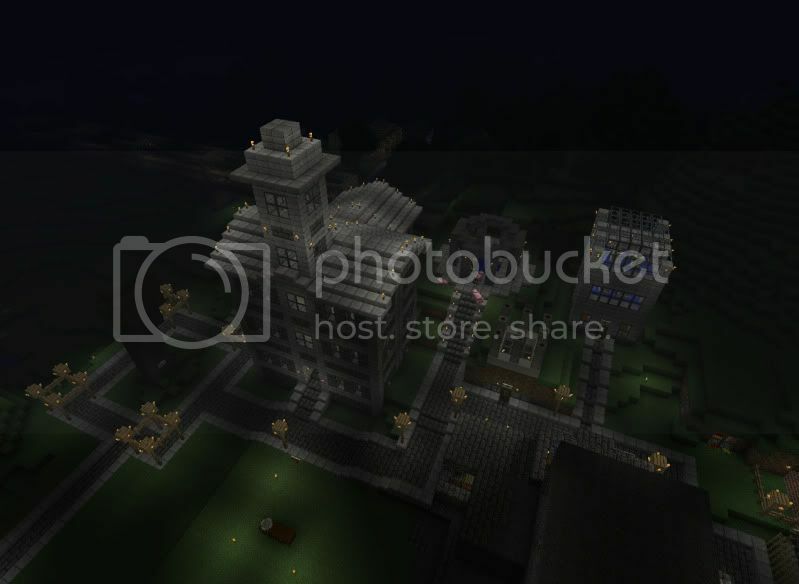 I thought I'd post a picture of Faffington by night. This is basically just the part in the west, but it looked so beautiful. The big building in the middle is our Townhall, which is one of the most recent additions to Faffington. The Stone Henge like structure is our temple or oracle. It also serves as swimming pool apparently. Or maybe it's blessed water and I'm constantly desecrating it by jumping in there, but whatever. Below the oracle you can see eight columns (which are cacti with a painterly pack texture to make them look like sandworms) This is the roof of Haseri's house. Right on the other side of the street is Tesla's house with the Warehouse to the right. To the left of The Town Hall is our town symbol, the Rock of Faff. Unfortunately there are no lights on it as we like to have it in its pristine and natural state, so it is unlit during the night. If you squint your eyes you can also see the railway that is build currently going off to the right border of the picture. It will connect Josasa's fort with Faffington through Minecart railways. I just installed a new mod called Too Many Items and according to part of the instructions for multiplayer servers, I have to be a "op". What does that mean? In the folder that you have Minecraft_server.exe, you'll see a file called ops.txt. Add your name to it.